Vulnerable to England’s varying climes, life at Charleston is undoubtedly one of contrasts: endless, balmy summer afternoons have recently yielded to brief and blustery days. Seasonal shifts are felt all the more keenly in the countryside. Unlit by streetlamps, landscapes plunge into thick darkness by teatime. Thin sheets of rain illuminate windblown trees; downpours decorate the pond with circular patterns reminiscent of those favoured by Bell. Smells linger in the air as drizzle slowly churns the ground to mud. Our coats must be heavier, our shoes sturdier. Optimistically picturesque interpretations of the changing landscape can be glimpsed in Angelica Garnett’s sketch books. Akin to the practice of flower-pressing, Garnett’s vibrant watercolours capture with an enduring beauty the ephemeral quality of Autumnal hues. CHA/P/2436/21 Angelica Garnett, Sketchbook. Photograph © The Charleston Trust. Unlike a painting – where the vista is apprehended all at once – a sketchbook implicitly places its images as part of a process; each page thus offers a snapshot of greenery in the midst of mellowing. Driven by spontaneity, sketching itself seems perfectly suited to the mercurial quality of the English climate: a sky quickly outlined in pencil can capture its particularly contingent geometry. Garnett’s vivid depiction of Autumn’s maturing landscape sets ripened foliage swiftly upon the page, capturing the essence of the season’s evanescent splendour before its inevitable loss. Garnett’s scene swims with a radiance and energy – salmon pink, periwinkle blue and a seemingly sunlit green intermix – commensurate with the transformations of Autumnal flora and fauna. Garnett’s technique may appear informal, but is undoubtedly influenced by the revolutionary compositions of late 19th Century French landscape painters. The Impressionists stood before astonishing variations of colour and light and responded with fluid, imperfect brushstrokes not dissimilar to the visual vocabulary of the sketch. Pared down detail gestures to Garnett’s desired Impressionist perspective, but also to the shedding of leaves looming within the rusty orange trees. Yet colour is applied not only as a nod to naturalism, but as a means of infusing feeling into the scene. Spots of purple and smudges of pink suffuse the landscape with a happiness idiosyncratic to Garnett’s experience. Garnett was not alone in her delighted response to the season: in October 1927, Virginia Woolf likewise rejoiced in the ‘bright October days’ and her ‘singularly happy autumn’. While Garnett sketches plants at their fiery height, Vanessa Bell’s 1950 painting of Charleston occurs after their fall, depicting a tree completely denuded of leaves. 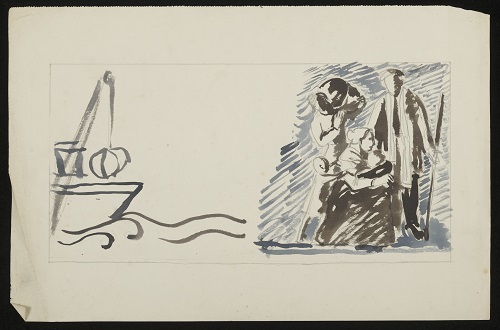 Charleston, East Sussex by Vanessa Bell, circa 1950-1955, The Charleston Trust. Photograph © BBC Your Paintings. Bell may have taken inspiration from both Charleston’s summer abundance and its more desolate variations, but sketches in The Angelica Garnett Gift are somewhat less vocal on wintry matters. Bell and Grant’s sketchbooks are bursting with portraits, pattern designs, figure studies and playful sketches, but landscapes – especially those expressive of more bracing weather –are conspicuously absent. Of course, dates here are crucial, a detail frequently elided in sketchbook composition. Bell and Grant only resided permanently at Charleston during the First World War and after 1939; decades passed where they saw Charleston bathed solely by the brilliance of midsummer. Exuberant decorations belie the harsh conditions in which they were produced. They had neither piped water nor electricity (…) The house was difficult to heat and often freezing; in winter it was sometimes necessary to break the ice on the basin before washing. Just as the fanciful paintwork of their interiors evoked an eternal summer – concealing, crucially, the hardships of later months – their sketches construct a fantasy space where weather holds no dominion. Thinking less whimsically, sketching may simply have been an impossible project, or at least less of a priority. Practicalities, as Spalding details, pressed upon the inhabitants constantly, inevitably interfering with artistic imperatives: ‘water had to be pumped, earth closets emptied, wood chopped before fires could be lit’. Thankfully, by the time of Garnett’s sketches and Bell’s commanding image of Charleston, central heating had long been warming the studio. With the complications and chores of simply surviving set aside, winter could be afforded equal artistic attention as more comfortable climes. And yet, there are moments in the Gift where subtle atmospheric imagery intermingles with the environment, creating work strikingly articulate of its meteorological mood. CHA-P-2270 Recto. Duncan Grant, landscape study, pencil on paper. Photograph © The Charleston Trust. Here, unwanted (if inevitable) wear and tear serves to reinforce a moody and murky atmosphere. Hastily set down, but long interned in the attic, the resulting patches of damp mottling this sketched pasture perfectly capture the clotting of clouds over a deserted landscape. Material traces of moisture unwittingly gesture too to the threat of rain. The furrowed corner energises the loose scribbles billowing across the top of the page, suggesting a tempestuousness that appears to leap from the figurative to the real. The sketch thus becomes an intertexture of imagination and lived environment, both a depiction and material deposit of wet weather. 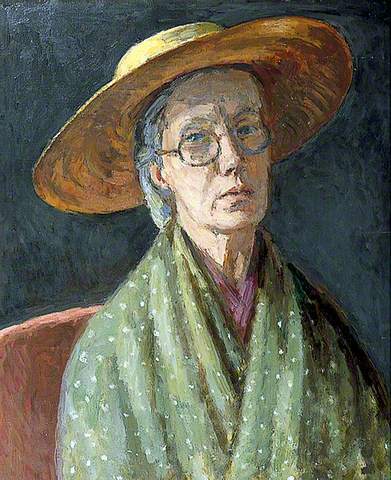 Vanessa Bell’s good looks, and famous family and friends frequently overshadow her reception as an artist. 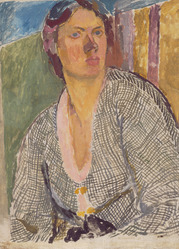 Throughout her four known, finished, self-portraits, Bell acknowledges these issues, making reference to her heritage, her frequent role as a model, and her position amongst the first generation of professional British women artists. Despite her reputation as a purely formal practitioner, Bell utilized these works to create direct statements about both her artistic and personal identities. Through them she positioned herself in relation to the canon, and insisted on her vocational commitment. Coming at either end of her career, these works can be read in sequence to provide evidence of the fundamental constituents of Bell’s practice, whilst also providing an index of the artist’s development. Places are still available. To reserve a place on this free event please contact The Paul Mellon Centre’s Events Manager, Ella Fleming on events@paul-mellon-centre.ac.uk. We hope to see some of you there. The Spanish Civil War was seen by many as a call to arms against fascism. As Julian Bell saw it, “non-resistance means suffering the full power of fascism. And fascism means, not only violence, but slavery”. Thus he wrote in his letter to E. M. Forster detailing his conversion from pacifist to passionate volunteer. He had been teaching English in China when he resolved to join the fight in Spain. This decision resulted in his tragic death in July 1937, after only weeks of volunteering as an ambulance driver, devastating his mother Vanessa Bell back at Charleston. This context gives a poignant background to a recent find in the attic. 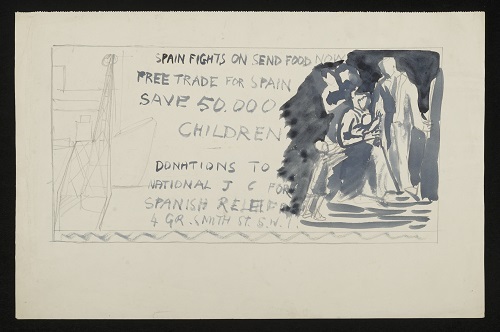 We have unearthed various poster designs in aid of the Spanish Civil War asking for donations to the National Joint Committee for Spanish Relief. The National Joint Committee was established by six British Members of Parliament after their visits to Spain in November 1936 and was set up to provide “purely humanitarian and non sectarian” aid. The poster designs we have found emphasise the suffering of 50,000 Spanish children and depict families stranded at harbours, crying babies and small frightened children clinging to their mothers’ skirts. The figures are dark and downcast. And the recurring image of the ship seen below suggests the help the British public can send across the channel to these innocent civilians. Earlier in the year of Julian’s death, in May 1937, Duncan Grant, Vanessa Bell and Quentin Bell visited Paris. Whilst they were there they saw Pablo Picasso who was working on his painting Guernica in his hotel rooms, based on the bombing of the eponymous Basque town the previous month. Quentin Bell had recently asked Picasso to attend an event at the Albert Hall in aid of raising funds for the children of Bilbao and Guernica would also be shown in 1938 at an exhibition arranged by the National Joint Committee to raise funds at the New Burlington Galleries. The poster designs we have found in the attic are part of this wider artistic and cultural cause inspiring humanitarian involvement in Spain at the time. However, as staunch pacifists, Julian and Quentin Bell’s parents Clive and Vanessa Bell and other Charlestonians such as Duncan Grant, who had been a conscientious objector in the First World War, were not so invested in the fighting itself. At the time they visited Picasso in his studio, Julian Bell had recently told his mother of his intention to fight in Spain. This must have coloured her response to the painting’s distorted figures and dismembered limbs clinging to broken weapons in the darkness. Picasso’s tortured figures express the tragedy and horror of the war that her son was intent on joining. Meanwhile, back at Charleston, David Garnett tried to persuade Julian Bell to stay and fight fascism from home, helping to prepare for war against Hitler. Although Julian Bell was unchanging in his conviction he did make a compromise, deciding to travel to Spain as an ambulance driver instead of as his new-found ideal – expressed in his 1937 talk to the Cambridge Apostles – as a solider. When he arrived in Spain he longed for action and on the 6 July 1937 was thrown into the thick of battle taking the wounded from the front at Brunete. During this time he wrote his last letter to his mother in which he revealed how Charleston was not far from his mind. He wrote of how he kept his ambulance, of the other men, and then about “the other odd element […] the Charleston one of improvising materials – a bit of carpet to mend a stretcher, e.g. – in which I find myself at home”. These words, “at home”, are especially moving here as he was never to return home again. On the 18 July his ambulance was hit and he was mortally wounded with a piece of shrapnel to the chest. He was one of the 35,000 men who lost their lives in the battle of Brunete. One design that we have found, in which the brutality of the war is personified in the traditional Spanish symbol of the Bull, depicts the horrors of war that Julian Bell would have finally seen on his last few days in the thick of the action on the Brunete front. This design differs to the others we have found in the attic, taking this symbol of Spanish nationality and transforming it into a threat to its own people. It brings the fighting itself into the frame. 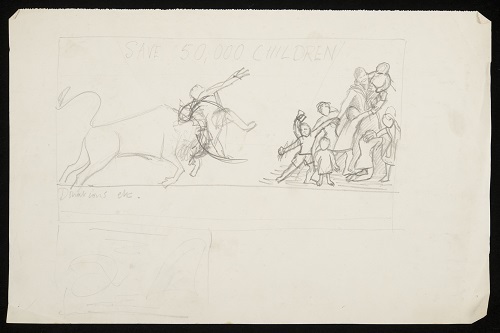 Here women and children recoil helplessly from the scene of a man being thrown by the bull. It seems that this design was discarded in favour of a version where the women and children are mourning at a distance from the fighting. We have found various and more detailed studies in different media for this design. 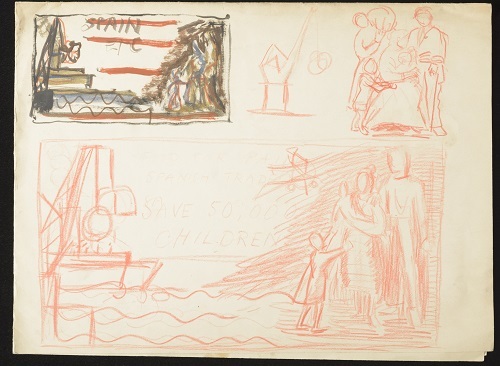 One sketch is executed in red pencil with a smaller painted study to show colours for the design as a whole on the same page. Here Duncan Grant is working with the harbour-side theme showing a family vulnerable beneath a fighter plane. There is also a smaller study of the design used in the further two studies, the central seated maternal figure reminiscent of Madonna and child. There are two further designs made in cooler blues and browns. In this change there is a move towards a more melancholy mood. Perhaps this reflected the mood at Charleston where Vanessa Bell was inconsolable with grief at Julian Bell’s death. At the time Clive Bell remarked “I doubt whether the hole in Vanessa’s life will be filled up ever”. Vanessa Bell’s children were central to her life, Francis Spalding noting how Julian’s birth “revolutionised her life, bringing out strong instincts which until then had laid dormant”. Indeed, in the maternal figure on the poster design below we can see Vanessa Bell as a young woman holding her first baby who was now lost to the war. The posters make a plea for the children of Spain and long for a different ending. Such was Quentin Bell’s recollection of Maynard Keynes’ bonfire celebration on the 5th of November the year before the Second World War. Today, as the sounds of Lewes bonfire spread across the fields to Charleston, images of fireworks, startling bursts of falling light, emerge from the Angelica Garnett Gift. In anticipation of tonight’s revelry we look to this study of another celebratory evening, perhaps at the Festival of Britain. 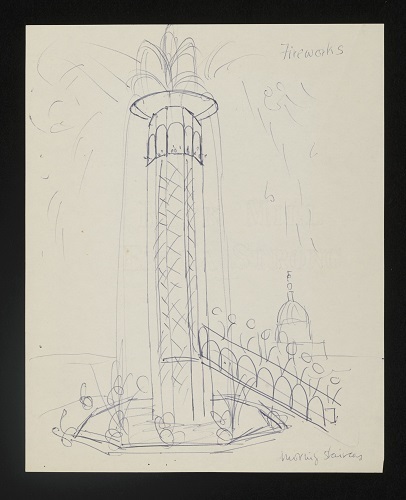 Although we cannot say whether the Charlestonians were ever amongst the thronging crowds at Lewes, they hosted their own firework displays every year for Quentin Bell’s birthday. Wishing you all a fantastic Bonfire night from The Charleston Attic! While the various influences, allusions, and subversions of the European art historical canon are quite evident – and exhaustively studied – in Bell and Grant’s aesthetic, this week in the gift we discovered an item gesturing to a source of inspiration far further afield. CHA/P/2332 Recto. Japanese landscape study, watercolour on paper. Photograph © The Charleston Trust. 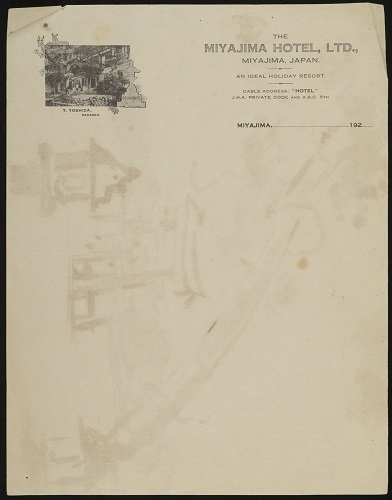 CHA/P/332 Verso, The Miyajima Hotel letterpaper. Photograph © The Charleston Trust. A piece of letter paper appears, at least initially, to express little of its guest’s adventures, but reveals overleaf a delicate watercolour of a Japanese landscape; hotel stationary is transformed into a hand-crafted postcard. The faint, mutable nature of watercolour is here keenly expressive of the fleeting, transient quality of foreign travel; the new environment is ecstatically grasped only to be abandoned days later for the familiarities of home soil. Under these circumstances, it is unsurprising that the written word – so fixed in its intentions and implications – was judged an inadequate medium of expression. Deeply responsive not only to the scenery, but to the sensibility of tourism itself, the piece offers a teasingly anonymous snapshot of a stint at the Miyajima Hotel. 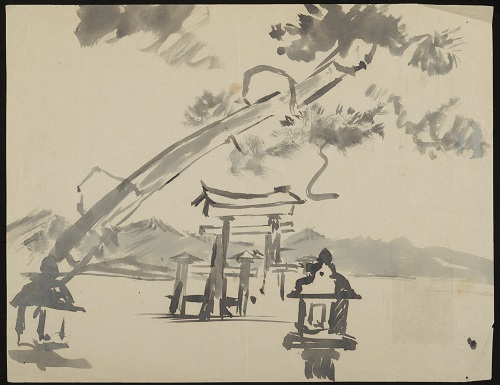 Curiously, as far as we are aware, neither Bell nor Grant ever travelled to Japan; however, Japanese culture was a point of great fascination for Modernist art and literature. European elevation and emulation of Japanese work dates to the late 19th Century, when a reopening of trade relations between Europe and Japan triggered an influx of Japanese art into France. French critic Phillipe Burty coined the term ‘Japonisme’ to describe the subsequent impact upon Western fashion, handicrafts, architecture, art and aesthetics. Concurrently across the channel, prominent curator and critic Christopher Dresser argued that an assimilation of Japanese design was essential in generating new forms for British decorative art. Needless to say, Burty’s quaint coinage and Dresser’s undoubtedly sincere enthusiasm conceal a broader trend towards Western appropriation of Japanese culture recognizable now as Orientalism. From his Japanese perspective, the Omega looked… well, Japanese. Its folding screens were ‘Japanese style’, its marquetry – indeed its entire aesthetic – reminded Noguchi of home. Literary culture was equally enamored with Japanese forms. Ezra Pound’s sparse, lustrous Imagist poem ‘In a Station of the Metro’ was thought to have been inspired by an ukiyo-e print glimpsed in the British Library. Woolf may have dismissed Pound’s work as ‘humbug’, but she too shared the Modernist fascination with Japan. Woolf and Bell were friends of Dr. Arthur Waley, an accomplished translator of Chinese and Japanese literature. Alongside numerous social opportunities for discussing Waley’s specialist knowledge, Woolf publically affirmed her approval of Waley’s pioneering perspective in her 1925 review of his six volume translation of Tale of Genji. 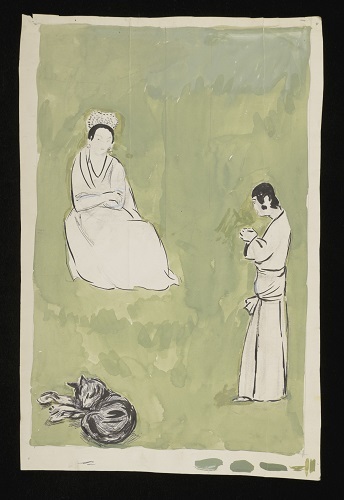 Grant’s interest in Japanese culture is evidenced in his later work (namely, Still Life, The Sharaku Scarf completed in 1972) and in more relaxed studies found in the gift. CHA/P/1805 Duncan Grant, painting, oriental scene, paint on paper. Photograph © The Charleston Trust. Grant’s Japanese study adopts the typical flat field of colour; the fluid, blotchy density of green paint follows pockets of light as they yield to murkier opaque shapes. The sunlit and shadowy are thus both accommodated without any shift in palette. Indeed, akin to a mercurial sky, a sense of the provisional hangs over Grant’s experiment in alternative styles. Smudges of paint outside the picture plane vividly visualise a preliminary moment of uncertainty, one so integral to the overall mood of the piece they remain – messy, playful, questing gestures – even on completion. With no formal signature in sight, Grant situates himself in the painting through this flurry of doubting brushstrokes. Yet familiarity lies close by. The sleeping cat (notably denser, more confidently set upon the page) recalls Duncan Grant’s 1932 painting Opussyquinusque; as we have previously explored on the blog, cats were common subjects for Bell and Grant, The cat can therefore be regarded as a form of anchor, a reminder of Grant’s signature style amidst a visual iconography that threatens to float off into the unknown. Returning to our tourist’s relic, perhaps the most compelling question is that of authorship. Who amongst Bell and Grant’s circle of friends took the months-long boat trip to Japan? Various figures float into view, in such a hurry to express their experience – a day of sightseeing the great Torii or the surrounding shrines of Miyajima – they composed upon the nearest canvas at hand: humble hotel stationary. However, try as we might, we found no trace of the Bloomsbury group in Japan. Despite his frequent flights of intellect and imagination, not even Arthur Waley managed the journey in his lifetime. Having unsuccessfully combed the entire Modernist canon for potential artistic tourists – encountering only Leo and Gertrude Stein, decades too early for our investigation – we finally admitted defeat. Our theory suddenly appeared facile. Although we assumed the work represented a personal artefact, it could just as easily have been a second-hand souvenir picked up from a nearby curiosity shop. Whether received in the post or purchased as an oddity, the painting nevertheless fascinates as a time-capsule of one mysterious tourist’s extraordinary trip.